So much for worries about him being rusty. Chris Sale struck out 12 over five shutout innings as the Red Sox outlasted the Orioles 4-1 Sunday afternoon at Camden Yards. 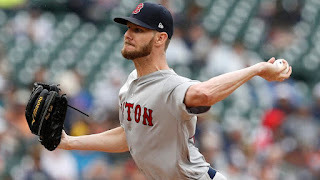 Making his first start since coming off the 10-day disabled list, Sale threw 48 of his 68 pitches for strikes. He only allowed one hit and did not walk a batter. He struck out every Baltimore batter at least once in winning his 12th win of the year. Steve Pearce gave Boston an early lead with a solo home run in the top of the first. J.D. Martinez doubled in the second Red Sox run in the fourth. The Orioles scored in the bottom of the eighth on a Trey Mancini sacrifice fly off reliever Matt Barnes. Craig Kimbrel allowed a walk and a base hit but struck out three as he recorded save number 35. Boston added insurance runs in the ninth on a run-scoring single by Jackie Bradley Jr. and an RBI double by Mookie Betts. Martinez and Bradley each had two hits in the win. The Red Sox swept the four-game series with Baltimore and head into Monday's day off a full 50 games over .500.